For lovers of the hit Channel 4 TV programme or those who are looking to create their own grand design. 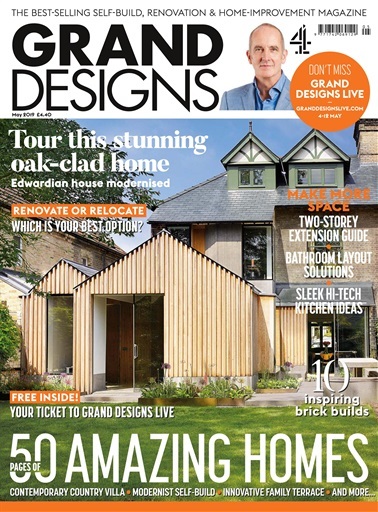 If you’ve ever dreamed about building your own home, whether it’s a cottage in the countryside or a studio in the city, with the Grand Designs magazine you will be inspired. Get FREE tickets to the live shows - subscribe today! • The secrets to the most successful renovations. • Up-to-date news and trends from the home and design industry. • Insights into the driving passions of the people who make things happen. • The best building and design ideas. • The magazine on C4's hit TV show, delivered straight to your door. • 44% saving on the cover price. 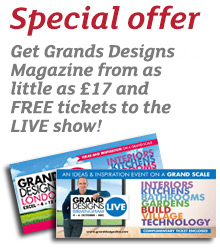 • PLUS receive 2 FREE tickets to Grand Designs Live shows worth £19 each!